Rome's major international airport, sometimes known as Leonardo da Vinci Airport (FCO), is 26 kilometers (16 miles) outside Rome. The airport tends to be referred to by its old name— Fiumicino, after the city it's closest to. There are both buses and trains between the airport and the train station but most take the express train named the Leonardo Express. The Express is predictable and even runs during strikes, although a bus may be substituted for the train. The express train will shuttle you from Rome's main international airport, Fiumicino, to central Rome's Termini train station. The cost as of 2019 is €14 per person and the 37-kilometer trip takes about 32 minutes. A Leonardo Express train leaves every half hour in each direction from about six in the morning to 11 at night. From Rome's Fiumicino International Airport: Trains to Termini Station start at 6:23 in the morning, with trains running each half-hour. The last train of the day departs at 23.23 (11:23 p.m.). At Termini Station, the Leonardo Express is found on tracks 23 and 24 (subject to change). Be aware that any offer to help you buy tickets or carry your bags is likely to lead to a demand for money from you. If you don't want to buy online, tickets can be purchased at the main ticket windows, as well as at the automatic ticket machines and at the news/tobacco stores in the foyer of Termini station. Validate your tickets prior to boarding the train by using the machines near the track, called obliteratrici in Italian. After you've picked up your luggage, follow the signs to Stazione FS/Railway Station. You'll have to go up 2 floors to find it. But, it's conveniently located inside the airport. Buy a ticket "Per Termini" at the FS ticket counter or from one of the machines in the station. A ticket costs €14. You must validate your ticket by inserting it in the validation machine before you enter the train. For information on other Italian airport transfers, or to get more information and up to date ticket prices on the Leonardo Express, see the Trenitalia Transfers to and from the Airport page. 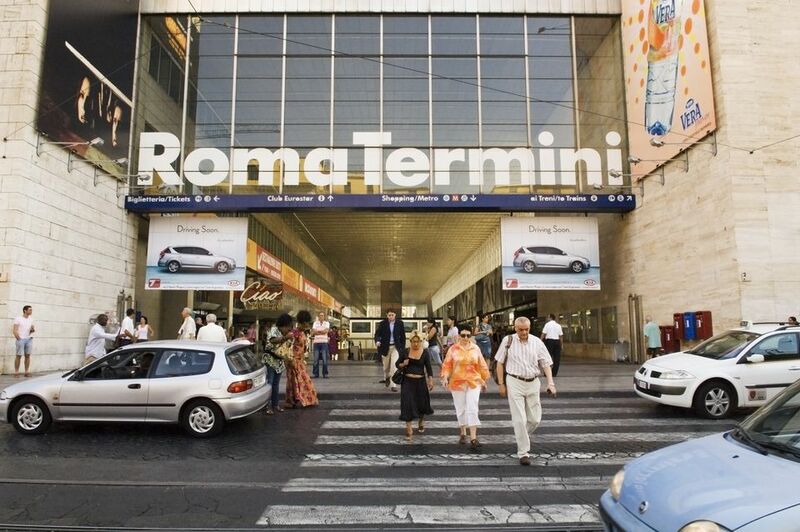 The Roma Termini railway station is the main exchange hub serving all transportation services for Florence/ Bologna/Milan/Venice and Naples/Salerno) to the railway station. You can, of course, get a taxi into central Rome by using the taxi stand in front of Fiumicino airport. Use only authorized taxis (white vehicles with a taximeter) available at the arrivals areas of each terminal. A Rome taxi ride should cost about 48 euros. There is a fixed rate for up to four people and their luggage. There are also buses from the airport. The train is quicker, but it's more expensive. The bus also offers a short panoramic tour of some of the main sights of the city (you will go past the Colosseum, at least). A Rome Airport Shuttle is also available, a van service which can take you to your hotel or private address in Rome.